The Toronto condo market is filled with investors speculators who inflated the condo bubble to its current size. Yet the actual proportion of them remains a controversial topic. Back in September we found out that, at the very least, 23% of all condos in the GTA were owned by investors. This week new data shared by CMHC showed an even more worrying trend - the number of investors is actually rising. 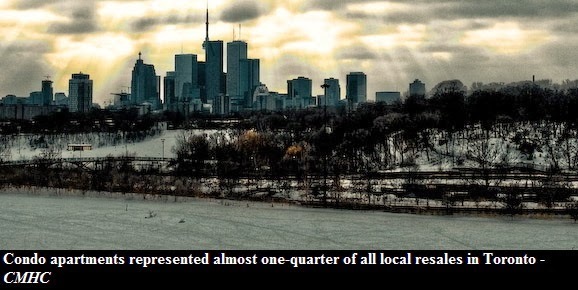 Now you may think that the proportion of investors in Toronto's condo market is quite low (23%) compared to other cities. But keep in mind that the above data is for the Toronto CMA which stretches as far as Milton. Consequently the concentration of investors in the new build condo market is severely diluted. Look, there are currently 144 towers under construction in the City of Toronto. In Mississauga there are only 7. The current condo boom is happening mostly within city limits. I am quite sure that the minimum proportion of speculators in the city's condo market is much larger than 23% in the Toronto CMA. For instance, in the CityPlace neighbourhood investors own at least 50% of all units. Furthermore, some speculate that in some condo buildings up to 90% of all the units were sold to speculators! But what does this all mean? Well, simply put, downtown condos will crash the most once the bubble pops! Just like it happened back in the early '90s.